On my way to an Asinabka event on Saturday I saw the woman in this picture. Since I write a lot on the effects of colonization, past and present, I asked if I could take her photograph for an article I will be writing on Palestine. 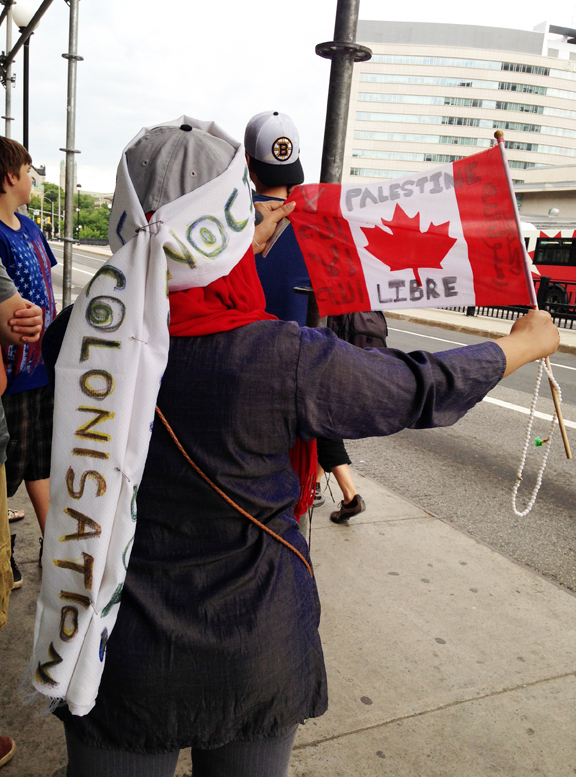 She was on her way to an event in solidarity with Palestinians on Parliament Hill. She felt it was important to show support. She agreed to let me take her picture but asked that she not be identified by name. So I will call her خديجة Khadija, the name of the wife of The Prophet Muhammad’s (Peace be Upon Him). Many people don’t realize the powerful story of how Islam began. The prophet was married to a successful business woman in Mecca. It is said that Khadija was 20 years his senior. When her young husband began to have visions that he didn’t understand and that were unsettling to him she told him to talk to the Jewish and Christian spiritual leaders she knew in order to find answers and solace. Through the support of a strong female and the spiritual counsel of people who came from different faiths another religion was born. The woman I met on Sunday shared with me as much as she could of her story before our buses arrived. Her ethnicity is different from the country she was born in because her family left due to a civil war. 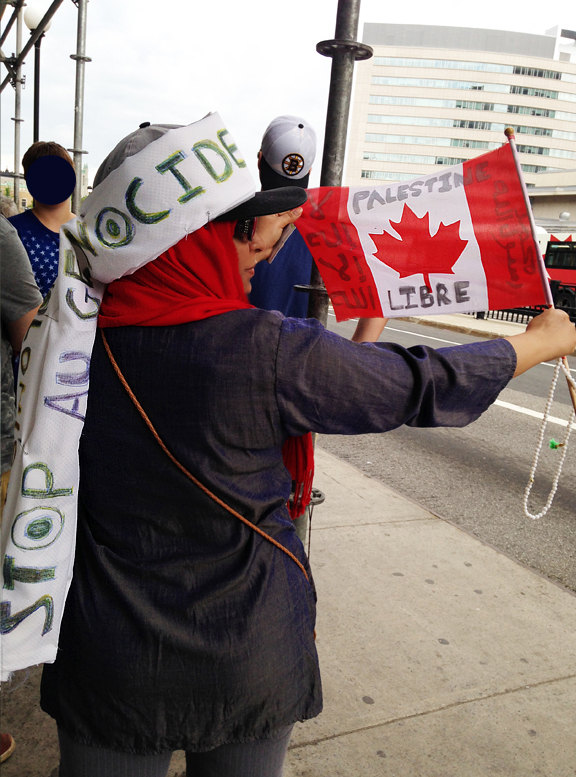 She has now left that country because of civil unrest there and has applied for refugee status in Canada. This is why she didn’t want to be identified. She said that when she decided to wear the hijab it stopped short her career back home as a teacher. Although not living in France she was teaching at a French school. They would no longer let her teach if she was going to cover her head. The day she put her daughter into school in Canada she arrived to find the teacher was wearing the hijab. “This is when I knew this country was my country.” And then she broke down. There were no words she could say at that moment to express the power of what she was feeling. The feeling of elation that comes with knowing you are safe but also knowing you have left a country and others behind, but a country that wasn’t your family’s motherland and your parents, siblings and friends are forever scattered. There is deep sadness that comes with this kind of dislocation and it can run through the generations. She was also anxious because her hearing for her refugee status was coming up. As she lost her words and the tears started falling down her face I grabbed her and hugged her hard. Two women, don’t know each other from Adam. We stood there hugging on the crazy busy bus platform of Mackenzie King Bridge. We didn’t talk. We stayed silent and then as I got on the bus I hugged her tight one more time and said I would think of her on the first day of Eid, the day of her hearing. That is how we build peace. She could have been Jewish or Atheist. She was a professional but she could have been a prostitute. It wouldn’t have mattered. For me she was another woman who is being strong despite also being afraid and she was in need of some Sister Support! Hugging is how we stay human. Being present to hear a stranger’s story is how we begin to shift the energy of oppression. DIVERSITY? IT’S A BIT OF A MIXED BAG: When There is a Multiplicity of Voices How Do We Hear What's Being Said? This entry was posted in Arab, Diversity, Feminism, Human RIghts, Identity, Middle Eastern, Photography Leah Snyder by admin. Bookmark the permalink.